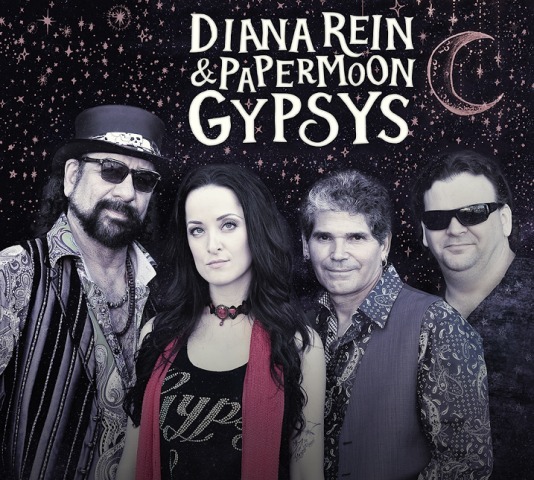 Meet SoCal’s coolest new blues-rock ensemble, Diana Rein & Papermoon Gypsys, who make their performing debut this Saturday, June 25 at the 4th Annual Orange County Food Wine & Music Festival, in the VIP Grand Tasting Pavilion, Sea Terrace Park, 33510 Niguel Rd. Showtime: 3:00 pm. General Admission: $10.00, Unlimited Drink Sampling: $40.00, Advance tickets are, $50.00, Children 5 and under, free admission. Guests must be 21 and over to consume alcohol. Please Log onto http://www.foodwineandmusicfestival.com for information and to buy tickets. The new group is co-led by vocalists-guitarists, Diana Rein and Kenny “Big Daddy” Williams, along with Joe Dolci on bass and Rich Smith on drums. Rein, also known as the “Six-String Siren,” has just released a new album, Long Road (Rude Mood Records). “Rein proves herself multi-talented by not only writing, recording, and producing Long Road, she also sings and plays lead, bass, and rhythm guitars,” writes National Blues Review. On Long Road, Rein – a big Stevie Ray Vaughan fan who moved to Southern California from a hotbed of the Blues, Chicago – displays a sharp tongue, driving blues-based guitar, and melodic solos. Conversely, Williams is a longtime SoCal musician who, in addition to Papermoon Gypsys, also fronts OC-based blues-rock trio, Bluespower. “Big Daddy,” as Williams is commonly called, is also co-owner of Kenny’s Music in Dana Point in addition to the Host of the weekly “Laguna Blues” radio show every Friday night on KX93.5 FM. “Big Daddy is one of those guitarists whose showmanship comes naturally,” writes Ed Simon of the Los Angeles Beat. Diana Rein and Papermoon Gypsys also co-headline the Blind Lemon Peel Pop-up Blues Festival at Blue Beet in Newport Beach on Thursday, July 7.